The J R stands for James R Stafford. 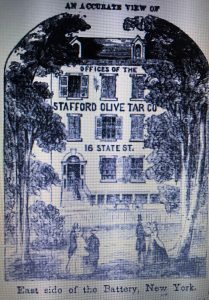 The earliest mention that I could find for both Stafford and Olive Tar is in several 1855 advertisements; one of them in a publication called the “Working Farmer.” The advertisements listed the company depot at 22-24 New Street in New York City. A year later, an item in the May 19, 1856 issue of the Brooklyn Daily Eagle announced that Stafford had relocated the business to 16 State Street. A representation of the State Street location is contained in a Stafford advertisement presented in the 1857 edition of Appleton’s Illustrated Handbook of American Travel. Around 1860 he moved to 315 Broadway and a year later he moved again to 442 Broadway. In addition, according to an item in the February 29, 1864 issue of the Brooklyn Daily Eagle he opened a second location at 278 Court Street in Brooklyn. By 1863 he was no longer listed at the Broadway address and in 1869 he vanished from the Brooklyn directory as well. The August 1871 wedding announcement of his youngest daughter referred to him as deceased, so it appears that he passed away sometime in 1868 or 1869. 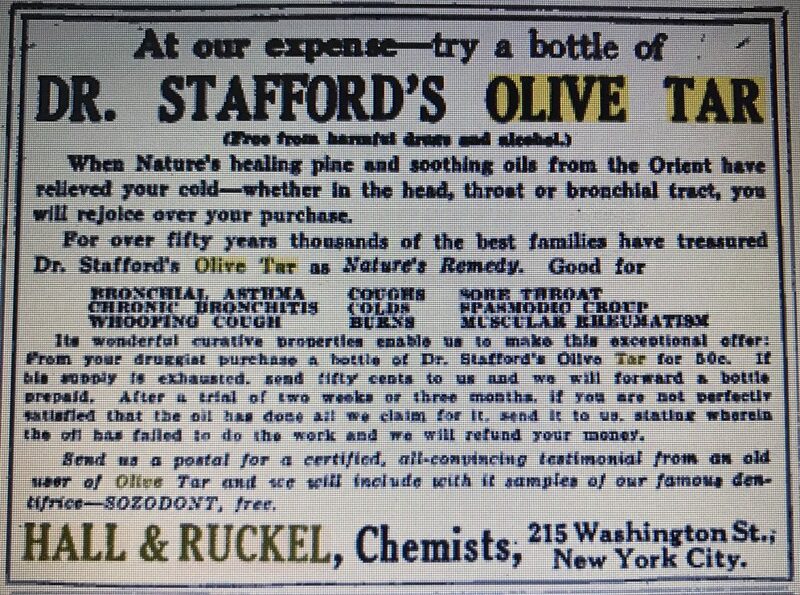 Around the same time as his death, the firm of Hall & Ruckel assumed the proprietorship and manufacture of the Stafford products, including Olive Tar. As early as March 6, 1869, a Hall & Ruckel advertisement in the New York Herald featured Stafford’s Iron and Sulphur Powders. Proprietors of and sole agents for medicinal preparations, toilet articles, etc. ; specialties: “Sozodont,” “Sozodont Tooth Powder,” “Sozodont Tooth Paste,” “Spalding’s Glue,” “Atwood’s Bitters,” “Madam Porter’s Cough Balsam,” “Dr. Zadoc Porter’s Bitters,” “Olive Tar,” “Mitchell’s Eye Salve,” “Sargent’s Sozoderma Soap,” “X. Bazin’s Shaving Cream,” and other of X.Bazin’s toilet preparations; also Bazin and Sargent’s Toilet Soaps, etc. At the time they assumed production of the Stafford products, Hall & Ruckel was located at 218-220 Greenwich Street. They moved to 215 Washington Street in the mid-1890’s and then to 147 Waverly in the early 1920’s. They were still in business in the early 1930’s and located in Brooklyn. It’s not clear how long they continued to manufacture Stafford’s Olive Tar, but I’ve found newspaper advertisements as late as 1928. The advertisement below is from the 1918 World Almanac and Encyclopedia. 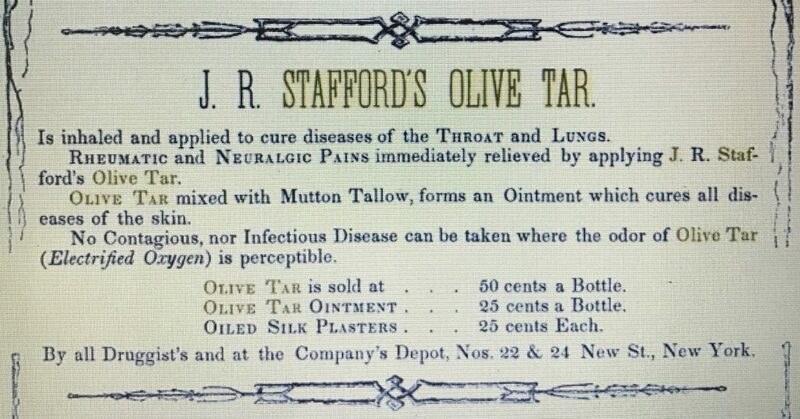 The healing, soothing, invigorating effect of the vegetable tar on the inflamed and irritated membranes was developed to the astonishment of the medical profession and the world at large through the introduction of Dr. J R Stafford’s Pure Extract of the resinous juices of the Olive and the Pine, as a specific for pulmonary complaints. It could be inhaled, taken internally or applied topically. When Olive Tar is inhaled, its healing balsamic odors are brought in direct contact with the lining membranes of the Throat, Bronchial Tubes and all the air cells of the Lungs, relieving at once any pain or aggravation, and healing any irritation or inflammation; when Olive Tar is taken upon sugar, it forms an unequaled soothing and healthy syrup for Coughs and all Throat Diseases; when Olive Tar is applied, its magnetic and concentrated curative powers render it a most speedy and efficient Pain Annihilator. Other advertisements claimed that applied as an ointment, it also cured all diseases of the skin. Dear Sir: Capt. Marcy placed in my hands for use, a small can of Olive Tar, with a request that I would give it a trial, as a remedy for sore backs on the horses of my company, and write you the result. This can containing less than a quart, I have been using since the 28th of June. I have about thirty horses in my company, with some ten or twelve sore backs. I have found the remedy a good one, healing entirely in a few days some of the backs, although ridden every day, and gradually healing the others. I regret that I have exhausted the can, and would like to see this remedy introduced into use in our cavalry regiments, as it is the best I have seen. As expected, none of the J R Stafford addresses date back to the time of the business. Two of the Hall & Ruckel addresses, 218 Greenwich and 215 Washington, are now both located within the overall footprint of the new World Trade Center site. The bottle I found is a mouth blown medicine, most likely from the late 1890’s, during the Hall & Ruckel proprietorship, probably right around the time they moved from Greenwich Street to Washington Street. A labeled Olive Tar bottle pictured on an e-bay sale notice listed Hall and Ruckel as proprietors and appears identical to the bottle I found.